What would compel a young person, a college art student, to approach a stranger and ask if he might photograph that stranger wearing a pair of silly sunglasses? What would compel him to do this dozens of times? Curiosity, an aesthetic and a combination of the two, he explains. “It’s interesting to see how they react to the camera – how some are so open to it, others not interested, and how they change what they are doing,” notes Jeremy Fink, a Saint Rose junior majoring in graphic design. Last summer he approached scores of people in Albany, New York City and several points south and asked to photograph them wearing a pair of novelty sunglasses with American flags for lenses. 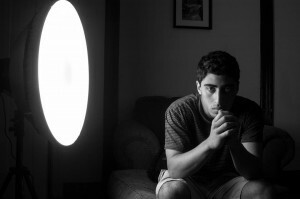 One of the examples has been selected as a finalist in Nikon’s annual Best of College and High School photographic contest. 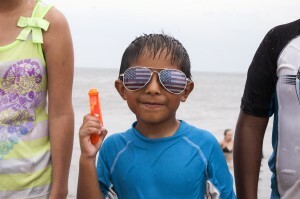 Fink’s entry, showing a boy in the patriotic eye wear pointing a squirt gun skyward, is one of 1,060 finalists – selected from nearly 17,000 submissions. The work is featured on Nikon’s web site and will appear in the Best of College & High School Photographic 2014, a hardcover book that is something of a time capsule of American photography. Giordano, a commercial and fine art photographer, said Fink stood out for his ideas. He said Fink’s American flag series, “The American Lens,” is notable because the photos rely on narrative. “At a time when images move so quickly through social media and smartphones, Jeremy pays attention to formulating an idea and paying attention to the composition,” said Giordano. Fink, a Latham native, came up with the idea last summer when he saw patrons wearing the American flag glasses at the mini-golf course where he worked. He bought a pair and set about seeing how people with little else in common might look wearing this common display of national pride. “The American population looks so vastly different. I wanted to see how all different people would look in the glasses,” said Fink, who designs posters for Saint Rose music performances and also plays music at Valley Cats baseball games. But the experience was as much about, well, the experience as the result. Fink has approached politicians, recovering drug addicts, wealthy people, non-English speakers, suburbanites and urban people, people at play and those harried on a lunch break. The image Nikon selected was made on a beach in Delaware, where a boy maliciously chased his sisters with a squirt gun. He instantly dropped his mean stance when asked to pose in the flag glasses. Then his sisters jumped into the frame. The resulting image leaves some questions about Americans and weapons – an interpretation viewer may make on his own.